Can You Cook Fish Without Batter? Ask your local fishmonger for tips and recommendations. 2 How Do I Pan Fry Fresh Fish With a Little Oil and Cornmeal? Crispy, deep-fried, battered fish is a classic, finding its happy place alongside thick-cut chips with a dousing of malt vinegar, on a bed of shredded cabbage with an array of toppings inside a taco or layered inside a burger bun with a huge dollop of tartar sauce. If your fish repertoire is limited to battering and frying, know that you’re barely scratching the surface of the many culinary techniques and approaches to cooking fish, and most are considerably less cumbersome. Don’t let fish’s reputation for delicacy scare you -- when the flesh turns from translucent to opaque, or reaches 145 degrees, consider it done. If you don't want to batter fish, but want the texture of a crispy crust, consider alternative coatings for fish fillets or goujons. Use the basic technique of dusting the fish with flour, dipping it in egg then rolling it in a coating, and adapt it to use cornmeal, store-bought or homemade breadcrumbs or crushed cereal, crackers or tortilla chips. Adjust the technique for lighter or thicker crust, and cook the coated fish by deep-frying, shallow-frying or baking it. Resting the fish in the refrigerator before cooking helps the coating stay on. Pan-frying fish with the skin left on is a simple and fuss-free cooking method, and when done correctly, it yields soft, juicy flesh with a textural contrast of crispy skin. The technique promises a desirable crunchiness without the need for any kind of batter or coating. Heat a little oil with a high smoke point, such as vegetable or canola oil, in a frying pan. Let the pan get nice and hot while you dry the skin side of the fish thoroughly with a paper towel. Season the fish, then lie it gently, skin-side-down, into the hot pan. Resist the temptation to move or inspect it as it sizzles. As the skin crisps up it, will contract and curl the edges of the fish away from the pan, so flatten it with a spatula so that it cooks evenly. After 4 to 5 minutes per inch of thickness, flip the fish over. Turn the heat down a little and cook for only a few minutes more, or until the flesh turns opaque. Most cooking techniques that you use for meat and poultry can be easily adapted for fish, usually with a reduced cooking time. Grill firmer fish, such as swordfish and salmon, directly on the grate; line the grill with foil or use a special fish basket for flakier varieties, like halibut, which might otherwise fall through the grates. Cook whole or filleted fish in the oven with some liquid and aromatic vegetables for a braised dish, or baste with a little hot oil for roasted fish. You can also seal fish, with or without seasonings and vegetables, within a foil or paper package. Bake the package in the oven to gently steam the fish and retain all of its juices. On the stovetop, steam fish on a heatproof plate placed inside a steamer with a lid, or poach it in stock, wine or milk. Use the flavorful poaching liquid to make a sauce after the fish is cooked. When you're buying fresh fish to cook at home, look for an overall brightness and plumpness. Whole fish should have shiny eyes. Cook fish on the same day that you purchase it. If you intend to freeze fish, make sure it hasn't already been frozen and thawed. 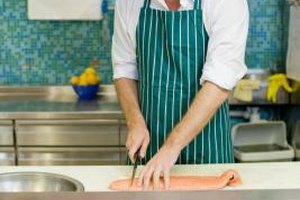 If you are unsure about choosing, preparing and cooking fish, talk to the fishmonger or the person working at the fish counter at your local market. This is also the best person to gut, scale and optionally fillet fish, if it hasn't been done already.